Bring English to life with practical tasks and evocative topics. Let your students share ideas with their classmates about their dreams and goals. 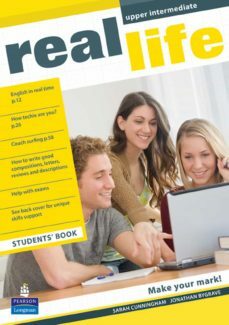 Real Life makes learning English achievable and gives students language they want to use. Real contexts to practise everyday functional language. Real language and opportunities to share ideas with classmates about goals, dreams and global issues. Real strategies for success in students’educational career, including speaking and writing skills and exam preparation. A course that: - highlights key language through Grammar2know, Words2know and Phrases2know. - incorporates technology to reflect a digital world. - gives teachers perfect flexibility with additional activities in the mini workbook at the back of the Students’Book. The Teacher’s Handbook incorporates reduced Students’Book pages with answers and notes as well as providing useful teaching techniques. Real Life learning with ActiveTeach - for resources and in-class presentation.